Do you know what is the limit for table filters (not view filters) ? From memory 255 characters. Should be an easy test..
Hi, can someone confirm that the characters limit for content grouping is 256 (such as the number of characters to define a profile filter)? I can’t find this information either in the document or in the official documentation. In the document, check the “Number of characters to define a profile filter” entry. This is 256.
so in the document with ‘profile filter’ it generically means content grouping too. Where did 2,000 hits per session for 360 come from? If you go over either of these limits, additional hits will not be processed for that session / day, respectively. These limits apply to Analytics 360 as well. If you go over this limit, additional hits will not be processed for that session. This limit applies to Analytics 360 as well. Hello Stefan – It turns out the increased GA360 limit is not an automatic extension. You need to make your request direct to Google for this. I will make this clearer in the next update of this doc. Confusingly there is a listing in the Admin area that shows the number of hits per property. However, 10m hits for Free is still very much at the account level. Thank you so much for sharing this great guide. I want to use Google Analytics in several apps and websites with my account. Do I have 20 custom metrics per property or all properties combined? excellent resource – thank you for that! Great catch Christoph – I will update the PDF soon. Hi Brian, have you heard of anyone ever getting shut down or having hits dropped due to exceeding the 10M hit per month limit? If so, how far did they exceed the limit by before there was a problem? Is there a limit on how many users (Google Accounts) are allowed per view/profile? We want our 200 webmasters to use the same analytics/property code on all their sites, but to be able to see a view that shows all traffic on all the sites that are using that code. We understand with a limit of 50 views per property, not all 200 would be able to have a view of their own. AFAIK there is no limit (within reason) to the number of users that can be granted access to a Property/View. Regarding “events per session”, in Universal Analytics (analytics.js), a visitor starts with 20 tokens and earns 2 tokens per second. With ga.js, it’s 10 tokens then 1 token per second. By the way your latest book is awesome! Are you referring to the possible combination limits for event category, action, labels? If so, as far as I am aware there are no limits on the number of these combinations. Every one could be unique – not great for reporting, but not limited in itself. If you sent a unique event for each hit you may run into other data limits – as per the table. Are these limits still current? Premium is a constantly rising bar, but Google Analytics standard (free version) is pretty much set in stone now and I do not anticipate them being changed. I agree with the others – great reference. Also agree about the ‘soft’ limits. I work with a site that regularly exceeds 80 million pageviews per month + events, etc. No complaints from Google yet. One thing I’m not completely clear on is what level these limits apply at. I’m assuming ‘Property’ level, as opposed to either ‘Account’ or ‘Profile’. Correct? Great reference guide, Brian. It would be neat if it could be embedded and re-shared to other posts and websites, linking back to your updated version. Just a thought. @Andre – thanks for the catch with 20 steps in a funnel step. I am not aware of any change to the table aggregation limits. @Serge – I have 1 million data “hits” as the limit, compared to the article to reference of 50,000 “visits” – they could be the same but I will double check. Similarly I have data in one GA account that goes back to 2005. Agin in my opinion it is not G’s intention to delete any data, but there are no guarantees beyond 25 month. May be one day they will need the space! @Andre – I don’t believe that the table aggregation limits in standard reports have been lifted. However, GA is still collecting the data and will report up to 1 million rows when those reports are ran “on the fly”. For example, if you apply a second dimension to a standard report that has (other) in it, the (other) will disappear because GA take the time to calculate all the rows. @Brian – I have not seen the 10 million hits per month or 25 month data storage limits imposed on any of the larger accounts I have worked on. Have you seen any clients that had an issue with these limits? I think Andre is correct. Furthermore, the intra day limit processing, according to the help center, is 50,000, isn’t it? Looking forward to seeing you in a couple of weeks! Brian, a few remarks: the number of funnel steps per goal is 20 in stead of 10. And isn’t the table aggregation limit for the top-content and keywords tables not raised to 1.000.000? 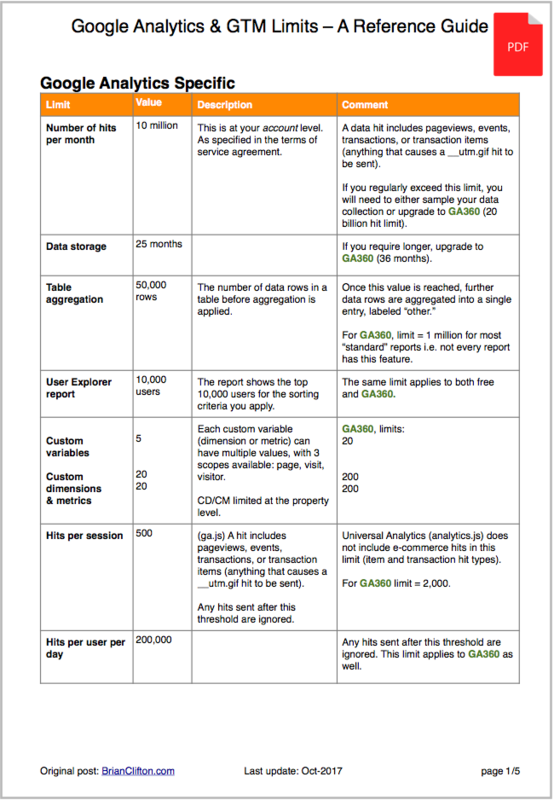 Great reference guide for us Analytics geeks!! Will be printing out and pinning to the notice board – yes I still have one of those!